The other day I was reading Leviticus 23 which sets out the major festivals in the Old Testament religious calendar. I was struck for the first time with the close proximity of The Feast of the Passover and Unleavened Bread to The Feast of the Firstfruits. 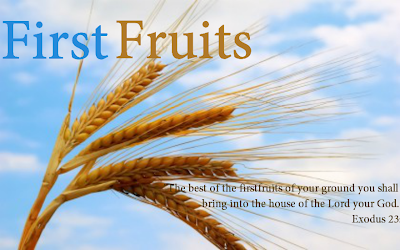 On the 'day after the Sabbath' [of Passover/Unleavened Bread], worshipers were to bring a sheaf of the firstfruits of their crops to the priest as an offering to the Lord, Leviticus 23:10-11, 13-14. This burnt offering made in spring time was a token of the full harvest that was to come. It was intended to invoke the Lord's blessing upon the whole crop, Ezekiel 44:30. One of the things that interested me was the timing of the Feast of the Firstfruits. The 'day after the Sabbath' could be taken as the day following the 'holy convocation' that marked the beginning of the Feast of Unleavened Bread on the fifteenth day of the month Abib (Leviticus 23:6-7). Gordon Wenham, however, takes the view that 'day after the Sabbath', is the Sunday that follows the first Saturday after the beginning of the Festival of Unleavened Bread. In that case, the token sheaf was offered on a Sunday, the first day of the week. As Wenham elaborates, the Last Supper was a Passover meal (Matthew 26:17) and the Gospels identify Jesus as the true Passover lamb (John 19:36 cf. Exodus 12:46. Note also 1 Corinthians 5:7). He comments, "Easter Sunday was probably the day the first sheaf was offered as a dedication offering. It is this ceremony which led Paul to speak of Christ in his resurrection as the firstfruits (1 Cor. 15:23)." [See The Book of Leviticus NICOT, G. J. Wenham, Eerdmans, 1979, comments on p. 302-304 & 306]. Philip Eveson also notes, "In the year that Christ died, Passover fell on a Friday, so that the following day (Saturday) was not only the special Sabbath of the the first day of Unleavened Bread but the ordinary weekly Sabbath...It is of profound significance that the Lord Jesus Christ, who died at the time of Passover, rose from the dead 'on the day after the Sabbath' to become the 'first fruits' of those who sleep in Jesus (1 Cor 15:20). The resurrection of Christ is the guarantee that all who belong to him will be raised from the dead to be like him." [The Beauty of Holiness: The book of Leviticus simply explained, Philip H. Eveson, EP, 2007, comments on p. 318]. Richard Gaffin pays close attention to Paul's use of 'firstfruits' language in connection with Christ's resurrection. He cites Johannes Weiss to the effect that, 'This little word contains a thesis'. Gaffin locates the Old Testament background to the apostle's wording in Leviticus 23 and other similar passages. He draws attention to the representative character of the firstfruits offerings and remarks, "'Firstfruits' expresses the notion of organic connection and unity, and the inseparability of the initial quantity from the whole." Applying this insight to Christ's resurrection, Gaffin explains, "it brings into view Christ's resurrection as 'firstfruits', of the resurrection-harvest, the initial portion of the whole. His resurrection is the representative beginning of believers. In other words, the term seems deliberately chosen to make evident the organic connection between the two resurrections...His resurrection is not simply a guarantee; it is a pledge in the sense that it is the actual beginning of the general event. In fact, on the basis of this verse [1 Corinthians 15:20] it can be said that Paul views the two resurrections not so much as two events but two episodes of the same event." [Resurrection and Redemption: A Study in Paul's Soteriology, Richard B. Gaffin Jr, P&R, Second Edition 1987, p. 34-35]. The apostle did not say, 'by his resurrection from the dead' (contra ESV/NIV), but 'by the resurrection from the dead'. Commenting on this verse, Leon Morris quotes Nygren who says, 'the resurrection of Christ and the resurrection of the dead are not two totally different things...For Paul the resurrection of Christ is the beginning of the resurrection of the dead.' [The Epistle to the Romans, Leon Morris, IVP/Eerdmans, 1988, p. 47]. Just as with the firstfruits, there is only one crop that is comprised of token sheaf and full harvest, so it is with 'the resurrection of the dead'. To use Gaffin's language Christ's resurrection and that of believers are 'two episodes of the same event'. Returning to 1 Corinthians 15, in Christ all shall be made alive (1 Corinthians 15:22). The last Adam will have his new humanity. As a 'life-giving spirit' the risen Lord will raise his people from the dead with spiritual bodies that we may bear his image. (1 Corinthians 15:45-46, 49). The resurrection of 'Christ the firstfruits' on the first Easter Sunday means there can be no doubt that harvest time is coming. And what an abundantly glorious harvest it will be, 1 Corinthians 15:50-55.